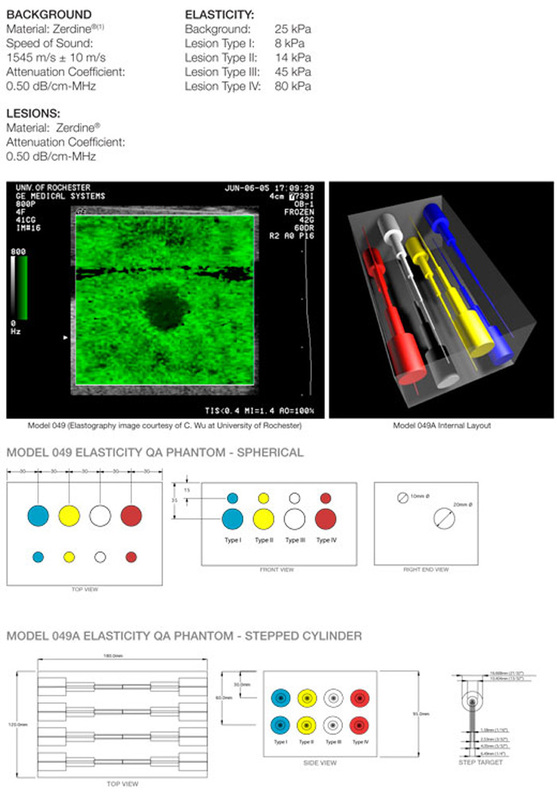 The Model 049 and 049A Elasticity QA Phantoms are tools developed for sonoelastography systems. These are the only phantoms commercially available for sonoelastography quality assurance. The phantom contains targets of known stiffness relative to the background material and range in stiffness, diameter and depth. 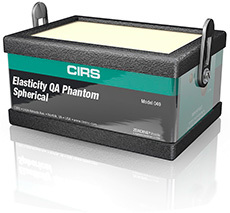 The Elasticity QA Phantoms are suitable for determining the dynamic range of the system, checking system performance over time, demonstrating system features and training personnel and customers on this rapidly growing field. The phantoms can also be used by researchers developing and verifying new techniques. The Model 049 is a basic QA phantom as it contains two sizes of spheres positioned at two different depths. At each depth there are two spheres that are softer than the background and two that are harder than the background. For a broader range of target sizes, the Model 049A is now available. The Model 049A has stepped mass targets instead of spheres. Each stepped mass consists of six diameters so that you can evaluate the ability to visualize targets that are located at the same depth and have the same relative stiffness but vary in diameter. The Model 049A is housed in the same size container as the original Model 049. Both phantoms come standard with a four-year warranty and a hard-sided, foam-lined carry case.